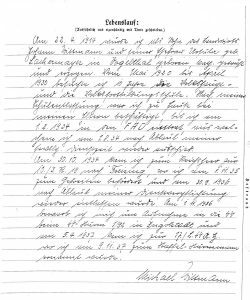 Michael Wittmann’s Curriculum Vitae (Lebenslauf) outlining his early life and career including entry into the Waffen-SS. The first part of a series of official documents held in official archives. Born on April 22, 1914, the son of the farmer Johann Wittmann and his wife Ursula née Lachermayer. Born in Vogelthal, baptised and educated as a Roman Catholic. From May 1920 until April 1930 I attended junior and vocational training school, and after leaving school I lived at home with my parents. I entered the FAD[note 1] on 1.2.1934, until 1.8.1934 and the expiration of my voluntary service. On 30.10.34 I joined the 10./I.R. 19[note 2] in Freising, attaining the rank of corporal on 01.11.35 before being released again at the end of my required service on 30.09.1936. 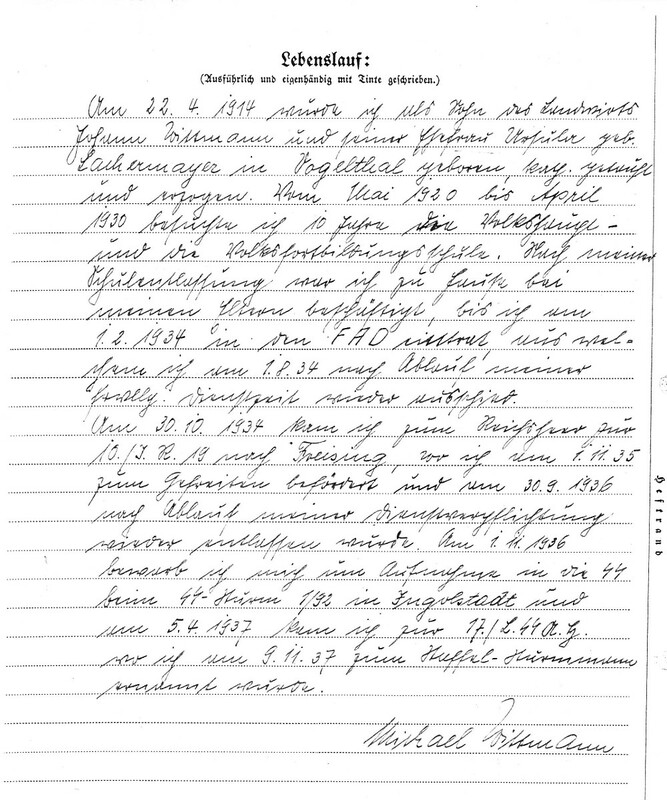 On 1.11.36 I applied for admission to the SS with the SS-Sturm 1/92 in Ingolstadt, and on 5.4.1937 was assigned to the 17./L.SS A.H.[note 3] On 9.11.37 I was promoted to Staffel-Sturmmann.